This week, we're focusing on how the 0.9.1 menu screens are more convenient, simple and inclusive! In older versions, it was possible for any player to go about changing the character, costume, alt, and even custom settings of other players. This could lead to frustrating situations, so we've locked these options to each player individually. You can still make changes for CPU opponents or change the player type (HMN/CPU/OFF) but as shown above, these players can no longer change each others’ settings! 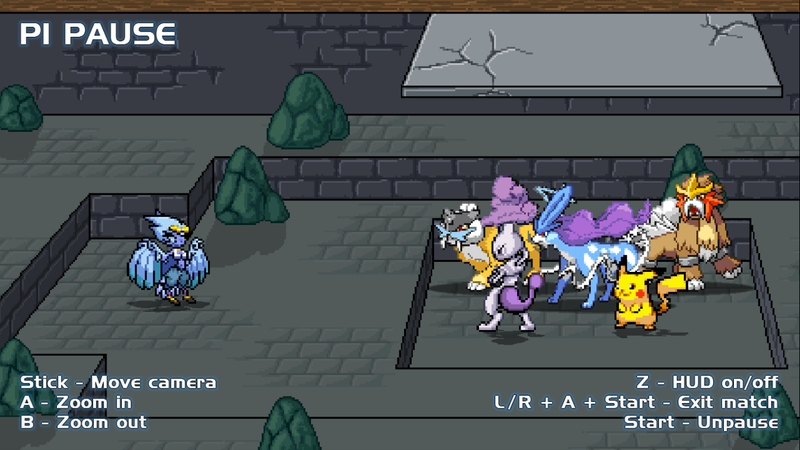 Many players may have found it tedious to change their costume or alt in the past, having to move all the way down to their character box with the selector in order to do so. This will plague players no more! Press Jump 1 (X) to cycle costume from anywhere on the screen, Jump 2 (Y) to cycle costume the opposite direction, and Grab (Z) to cycle Alts! You can even do this while holding your token over a character before selecting them to preview alts and costumes, and to set the costume or alt of a CPU! 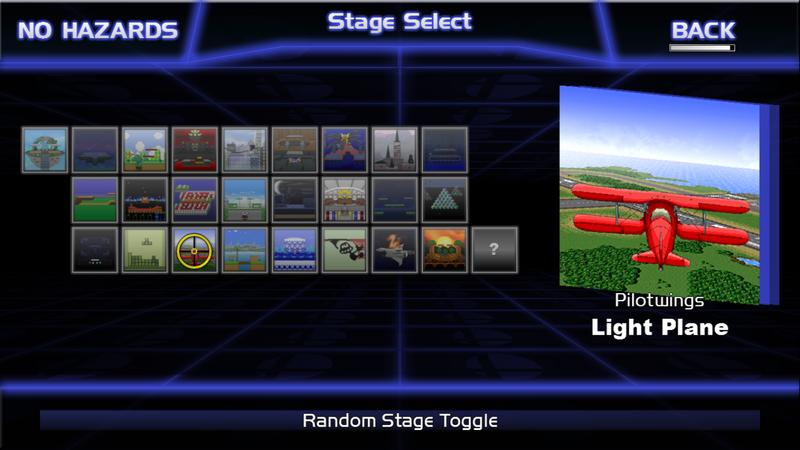 The Stage Select Screen has undergone some improvements as well. In the top right corner you may notice a bar under the "Back" button. On any Character or Stage Select Screen, hold Special (B) to exit to the previous menu! Players will no longer be required to manually select "Back". We've also moved the Hazards toggle to the top-left corner of the Stage Select Screen, and it can be conveniently toggled with the Grab button (Z)! Now you can easily switch between Hazard options while you are picking your stage! Players may now select stages with the Start button as well as the A button, and the empty spaces can be selected resulting in Random! Looking to get into the game quickly? From the readied Character Select Screen just press Start twice to instantly jump into a random stage! Maybe this option wouldn't appeal to you, as there are stages you don't like to play on. Don't worry, you can customize that as well! 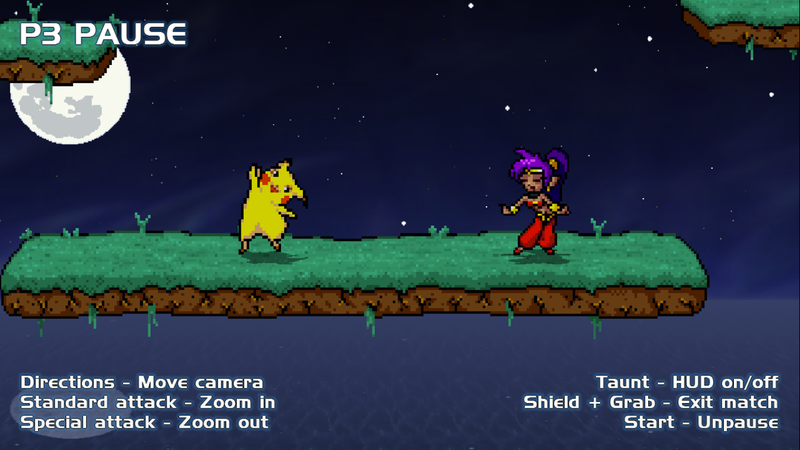 Move to the bottom of the screen and press the Random Stage Toggle button! 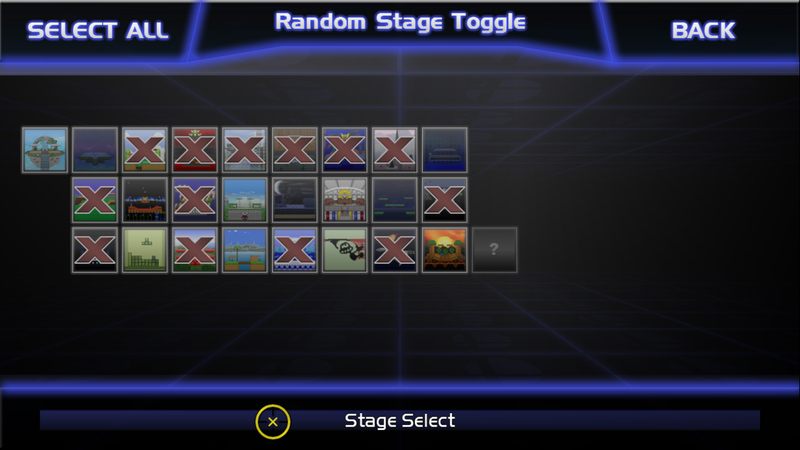 With this screen, you can now control which stages are permitted to appear when selecting Random! Press A to ban and un-ban any stage, which will be marked clearly with an X. There's even a Select All button, which can also be activated with the Grab (Z) shortcut! This button will select all but one stage, or clear all current selections! You can then press Special (B) or the Stage Select button at the bottom to go back to the Stage Select Screen. This Pause HUD should be familiar, yet something has changed. The player who paused the game will now be displayed in the top-left. And just like we did with the Character Select Screen, Pause Screen will now be locked to the player who initiated the pause! 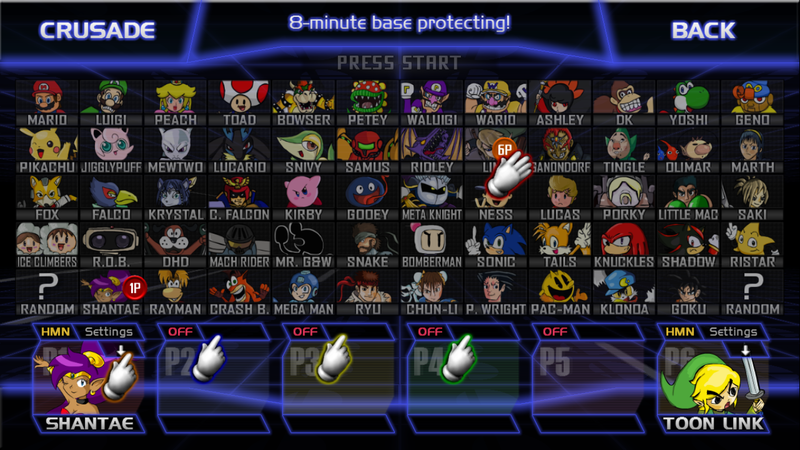 The player port in control of the Pause Screen will always display in the top-left corner of the HUD. But that's not all we've done to the Pause Screen! When playing with a controller, the input names will all change to buttons! Furthermore, the method of quitting the match changes to the classic Smash Bros. staple: L/R + A + Start! This is a more convenient and familiar button combination for those playing on a GameCube controller setup! Some players have run into problems accidentally quitting the game, or newer players have thought Esc might quit a menu or match rather than the entire game. To prevent accidental closing, we've implemented a freeze prompt. Didn't mean to do that? Just press any key and get right back into the action. 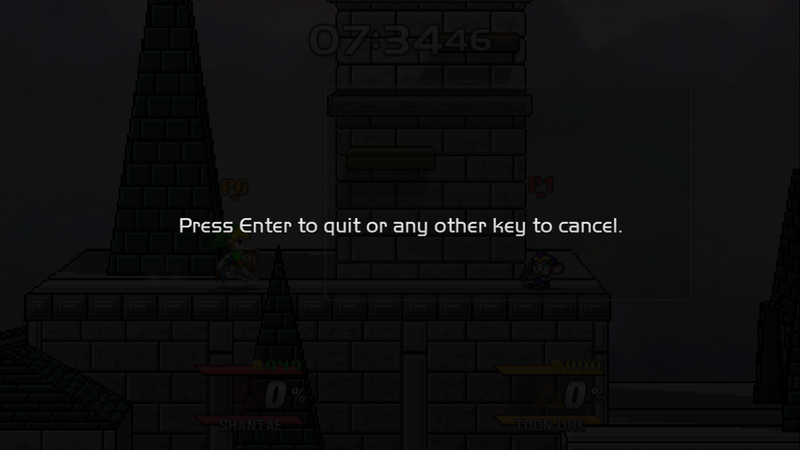 Or, press Enter to continue with closing the game. With all these new features, we hope to make 0.9.1 the most intuitive and customizable version of Crusade to date! Excited to try out 0.9.1? Let us know what you think! Tune in next week to see how we've been improving the cast as a whole! And the Shantae teasers. Nice to see the revamped menus. I'll assume Toon Link was moved to be one of Link's Alts? Nice, but the new Shantae hints tho. I'm glad about how frequent these updates are. Are those new stages I spy? Yeah, we've only known about those since the trailer over a year ago. While I have been gone for a while I tried to keep up with all the updates and boy do they look great! Also did anyone else notice that Shantae has the alt arrow? Dayum! I'm liking this update more and more! Sigh, I understand that these dev blogs have been taking a while, but understand that the team has their own lives to attend to. So we may or may not see it today. You'll just have to wait and see. I'll assume Toon Link was moved to be one of Link's Alts? That's leaving a bad taste in my mouth already. I mean, it kinda doesn't make sense to have two random slots. They could have just put Ristar where the left random slot is and then put Shantae where he was. That's a wavelength I can't flow with. Yeah, how dare I?